Is it ever acceptable for a motion picture to co-opt a real-life tragedy as fodder for horror? I'm troubled by the notion; on the one hand I think it's perfectly acceptable to modify the real world to generate art, but on the other it's very easy for a film to come across as crass, tasteless and sometimes even actively offensive. Chernobyl Diaries, written and produced by Oren Peli (Paranormal Activity) and directed by Brad Parker, treads the line in a fairly haphazard fashion. For the most part it's a diverting low budget horror flick, but then from time to time it feels... inappropriate somehow. The Chernobyl disaster was a real event, with 5,000,000 people in its contamination zone. Turning that into the basis for a (look away now if you don't want to know) mutant cannibal film is a fairly tacky manoeuvre. The film follows a group of relatively clueless young American tourists as they accompany Russian tour guide Yuri in a journey to Pripyat, the residential city that once housed Chernobyl's workers. They quickly realise they are not alone. They rapidly find their van sabotaged. Yuri goes missing. People start panicking. And so on and so forth. To be honest, aside from its fairly dubious premise there's nothing in Chernobyl Diaries that hasn't been done many times before. It's a well-worn cliche: young Americans in trouble, splitting up and going missing, getting picked off one by one and some terrible menace hunts them down. It's telling that the film's scariest moments come from marauding packs of wild dogs rather than from some mutated, fantastical creature. Real-life horror trumps fantasy horror every time. The cast are generally solid, all things considered. I didn't realise until quite late into the film that the actor playing the lead was one-time US teen idol Jesse McCartney. Nathan Phillips plays what must be his stock role by now: larrikin Australian trapped in a horror movie. I think the strongest performer is Devin Kelley as Amanda: she's believably strong and resourceful in a genre where women are often short-changed. 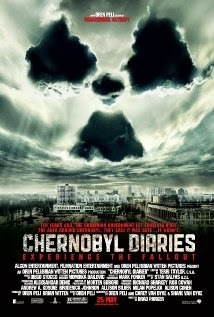 Chernobyl Diaries is not an original film, and it's not an exceptionally good one. It is, for the purposes of its genre, perfectly sufficient. Scary things happen at appropriate intervals. The character behave the way the horror audience expects them to behave. If you're a keen fan of the genre, it will entertain you for 80 minutes. If you only drop in and out of horror movies, cherry-picking the ones that are really worth your while, then it's probably safe to give this particular film a miss.